Phuket pronounced (pooh-ket) is down south inThailand. This means beautiful beaches and warm sunny weather everyday of the year. The sea is calm and warm. Unfortunately when we arrived the air was gloomy and hazy. This is because of the heavy smoke coming from Sumatra (click here for information). The farmers slash and burn their fields to harvest new crops faster. It’s becoming a huge problem and somewhat crippling the tourism to Thailand’s southern islands. The air quality has reached dangerous levels at certain times. We were really bummed and thought we would have to cut our time here short. But it did clear up a little. 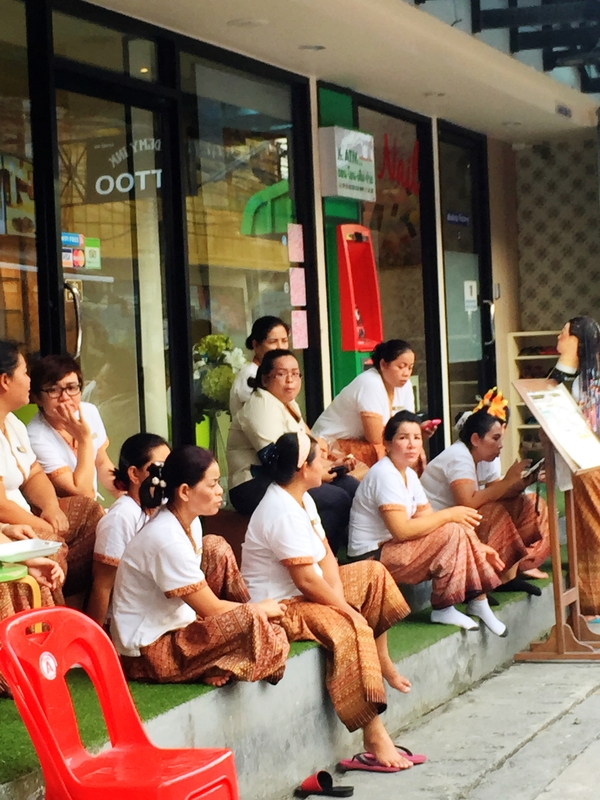 Phuket now fully caters to tourist. Russian tourist are everywhere in Phuket. 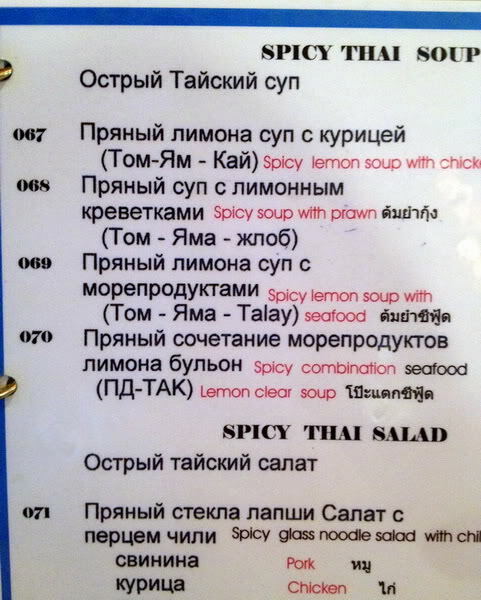 Some restaurant menus and signs are in Russian. They out number the Chinese tourist. The beaches are serene again. Thanks to the coup that sent in military police to clear the vendors (click here for information). The vendors were dominating the space on the beach with everything from chairs, umbrellas, food, clothing, massage, etc. This was a huge problem stemming from corruption, and went on for decades. 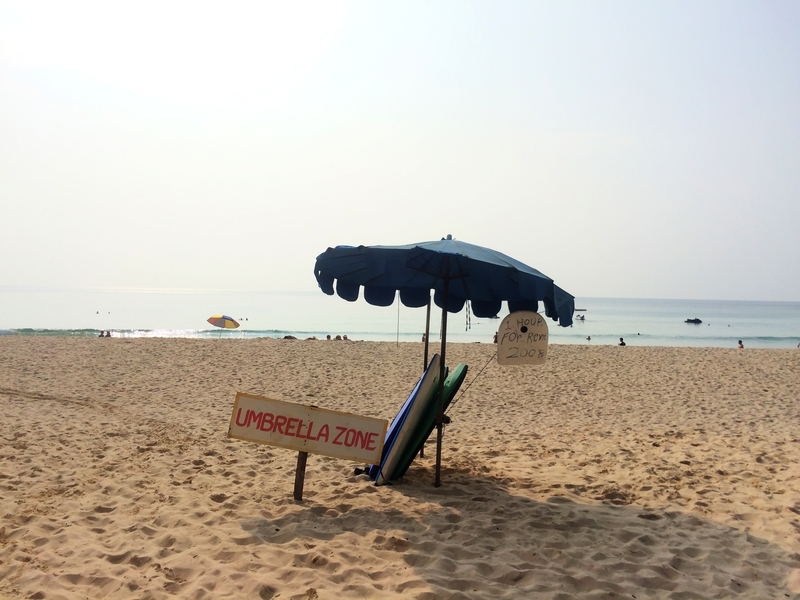 The governor of Thailand is now allowing locals to rent out umbrellas and beach mats on 10% of the beach, in certain areas. Within the 10% allocated to vendors, locals are allowed to offer massage services and sell some non-alcoholic beverages between 9am-4pm. Outside of those rules, no umbrellas, chairs or food are allowed on the beach. We stayed in Kata near the beach. 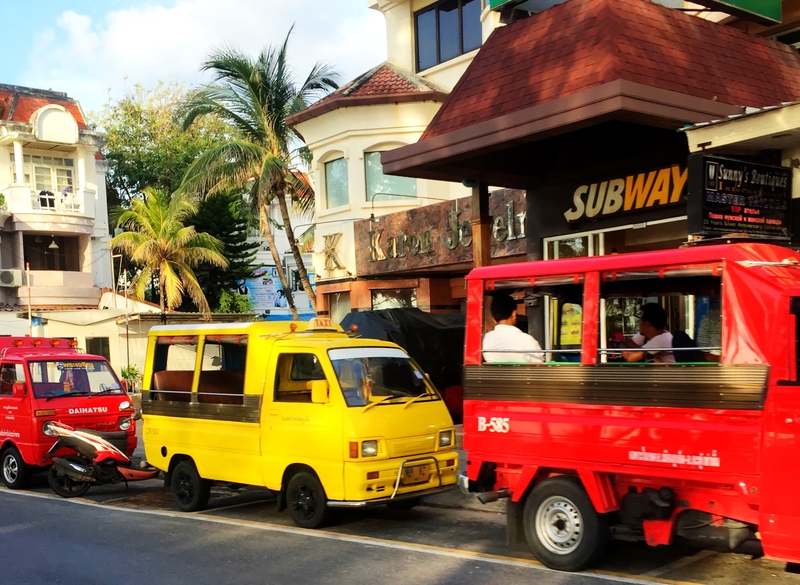 Patong and Kata beach are run down and have turned into tourist central. Karon beach is really nice and manicured. I liked it there much better. All of these beaches were within a 5-10 minute motorbike ride. A taxi would cost about $10.00 (USD) each way. That is extremely high considering the distance. The taxi cabs are still corrupt. They all have outrageous set rates and monopolized the transportation leaving tourist no choices. We avoided using taxis and rented a motorbike. There are a few metered taxis but good luck getting them to use the meter. The prices are higher for international food because the ingredients have to be imported. Even the Thai restaurants surrounding the beach area sell pasta and pizza. I tried Turkish food at a Turkish owned restaurant and it was a nice change. The only problem was when the owner came to clear the table and saw a little food leftover. We explained we were full. Instead of taking the food away, she told us to sit and rest awhile then eat it later. As much as I’ve been saying I don’t like Thai food. I really don’t like the “western” food offered here. Something is always off. I ordered a steak sandwich from a high-end restaurant. The picture had a sandwich with steak oozing out of the sides. When I got the sandwich, there was one skinny piece of rare roast beef (fat included) cut into four 3 inch squares, and tons of vegetables. 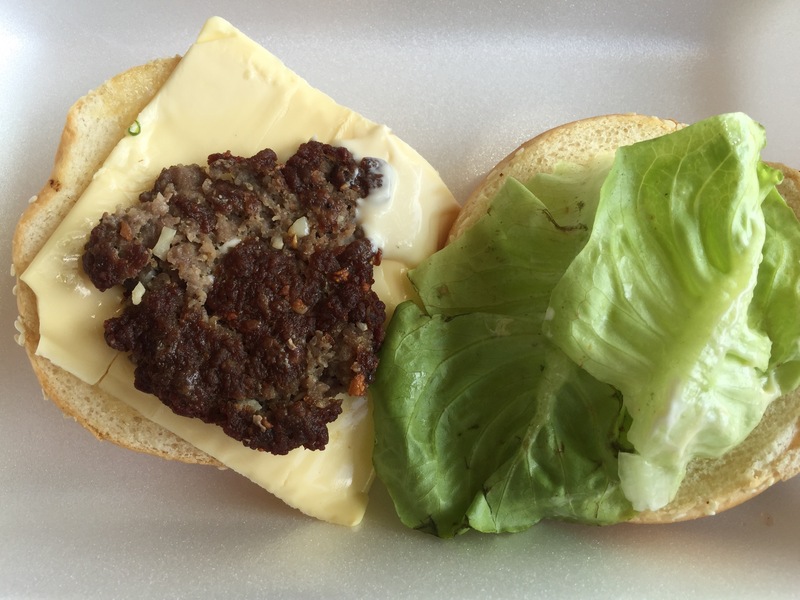 Another time I ordered what said “cheeseburger” on the menu. I opened the bun and the cheese was larger than the super thin burger. The burger had garlic and carrots sticking out of it too. I’ve seen the shows where a celebrity goes with a guide to different countries and eats all kinds of foods sold on the streets of wherever they are. But actually being here and seeing it without the cameras is a different story. My encounters with Thai food has mainly been seeing it sold on the streets. I never could really get myself to eat any of the street food. After going to a highly rated Thai restaurant, I finally tried different things and liked all of them. Maybe because the menu described in detail the ingredients and what it was. Years ago we visited Patong beach in Phuket. The tsunami wiped this entire area out in 2004. We watched the tsunami on television from home in 2004. Being there this trip we saw the exact streets people were running for their lives as the water rushed in. The beach is right across the street making this one of the hardest areas hit. Not only is this area built back up, it’s crowded with shops, bars, hotels, bike rentals and massage outlets. Touts are outside every restaurant asking you to “have a look” while shoving a menu in your face. Massage parlors are yelling “Mah-sage” to anyone walking by. I walked by one store and the guy simply said “help me”. Not only is it crowded, its over built. They even added a full mall and huge Starbucks and Burger King. The thousands of power lines running openly through the area are just waiting for another tsunami to electrocute everyone. Patong also had a string of prostitution bars. Now that Patong is a tourist area for families, the prostitution bars weren’t as busy as they were in the past. In fact most of them were empty. Here is a strange but dangerous video I taped on the beach. A paraglider was set to go up. Watch closely as a guy jumps on his shoulders as they fly off! Staying only two nights, I was ready to leave. I remember Thailand being a place that was serene and quiet. Those days are over in Phuket. Very interesting—you are certainly seeing and doing everything.